Marisilina Waqali was a proud student, mother and wife after she gradu­ated with a Bachelor’s degree in Environmental Health yesterday. 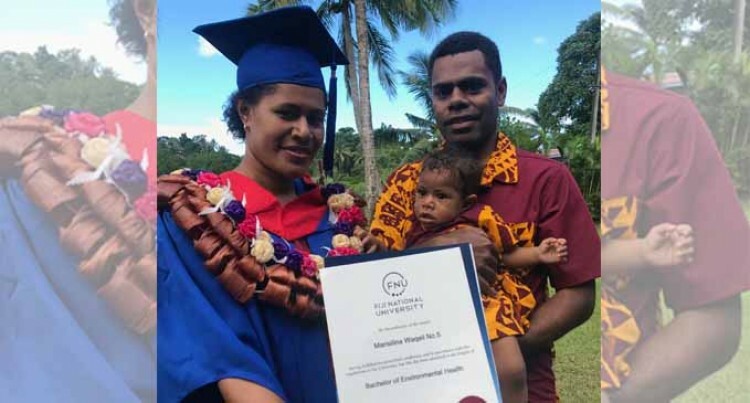 The Fiji National University stu­dent said being a wife, mother and a student was a challenge. She said while walking up the stage to receive her degree, she was proud and emotional because of the support of her family and her husband’s family. “I was a full-time student and my husband looked after our daughter while I was in school,” she said. But, Mrs Waqali said, the chal­lenges she faced encouraged her to move forward. She acknowledged her parents for their financial support. “My parents with my younger brother were in the village farm­ing to support me,” Mrs Waqali said. She is the eldest of two siblings. She was among the 43 students who took part in the graduation ceremony at the Novotel Suva Lami Bay Convention Centre.